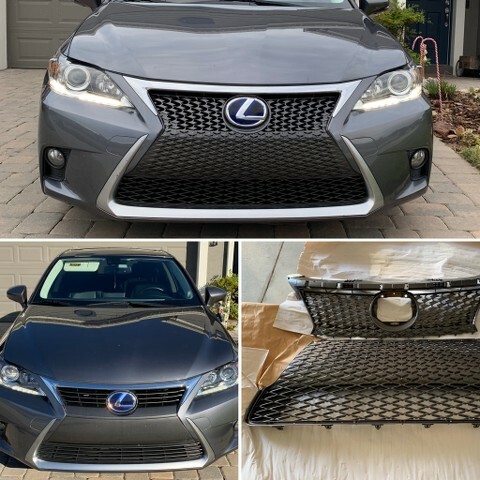 Upper grille, 2014-15, W/F SPORT for 2015 Lexus CT200h 5311176040 Confidently order now with confidence. From the diagram comparisons, it doesn't look much different than the non f sport. Also been combing through the threads with no success. Any help in the matter would be appreciated. It is a direct swap. 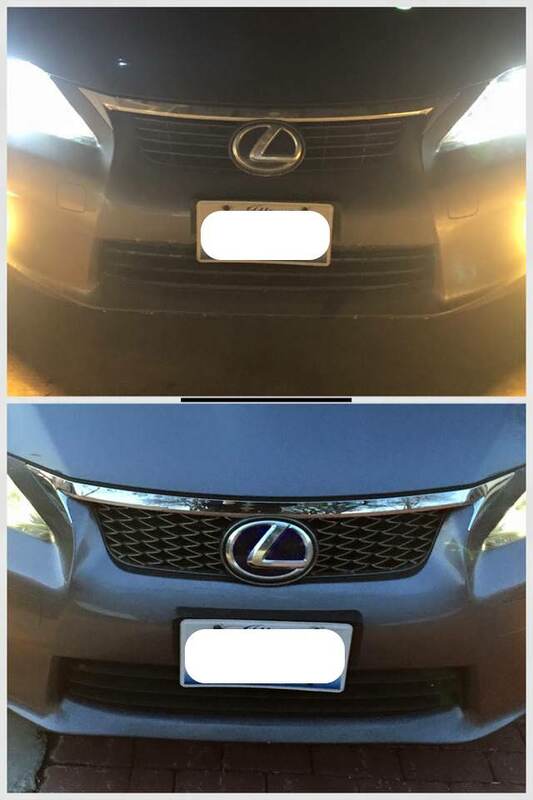 The base model bumper cover and F-Sport are the same. You just have to cut out the opening for the splitters/fog lamp covers. (just to slide the tabs in). The bumper cover already has the cut-out diagram on the back. I bought upper and lower F-Sport grilles and r/l fog lamp covers (splitters). I'll post some pics once it's all finished. 2012 CT200h f-sport premium audio package, interior & exterior puddle LED, color matched door protector strips, front hood damper, SS door sill & rear scuff plates, aftermarket mudguards and Shark fin antenna, F-Sport shift knob. Led License plate light housing. All exterior led bulbs. 2015 F-sport front bumper. Awesome! I took a look at it and it seems that the whole bumper needs to be removed. Just haven't found the time to pull it off yet. Look forward to see your finished product. I know this post is a bit old.. but considering this swap.. did anyone have any pics to share or lessons learned? I'm with austious! i'm bringing this post back from the dead! any more info? Last edited by burstaneurysm; 04-05-2018 at 11:44 PM. Just did mine with OEM F-sport grills. Such a better look. Only took about 2.5 hours. Any tips you can give us to overcome anything? Did you have to do any cutting? I have the sport grille at home waiting but I haven't gotten started, yet. I may try to get the sport foglight bezels and some Halo fog lights before I attempt anything just because I assume I'll have to take the bumper off and I would rather knock it all out at once. I'm trying to find someone that may have swapped out the bezels so I can verify that there were no issues. I'm getting conflicting stories when I look at parts online. Happy New Year! sorry for the delayed reply. Removing/replacing the grill from the bumper was easier then the above write up. New CT Owner from SoCal. Anyone know where i can get an F Sport Grille?